Mr. Redlegs in the 2011 Opening Day parade. FSO will deploy a 10-person team of personalities Thursday as the Reds start the celebration of the 150th anniversary of the Cincinnati Red Stockings, the first professional baseball team. Viewers will see FSO veterans play-by-play announcer Thom Brennaman, analyst Chris Welsh, Jim Day, Jeff Piecoro, Brian Giesenschlag, George Grande and former Reds pitcher Sam LeCure, plus former WCPO-TV anchor Kathrine Nero, WNKR-FM country music host Pat Barry and Shannon Ford. The Wapakoneta Optimist Precision Lawn Mower Drill Team marches in the parade every year. 9 a.m., FSO: Links to the Game: Cincinnati's biggest baseball day begins with golf. Former Reds pitchers Bronson Arroyo, Kent Mercker and Welsh will chat while playing golf at Kenwood Country Club with pro golfer Jimmy Hanlin. 10 a.m., FSO: Piecoro and Giesenschlag host live coverage of Reds Opening Day celebrations from Washington Park with reports from Barry at Findlay Market, Ford at the Reds Community Fund Charity Block Party at The Banks and Grande from Great American Ball Park. 11 a.m., Fox 19: WXIX-TV covers the parade preparation and activities at The Banks and Great American Ball Park. Noon: 100th Findlay Market Opening Day Parade coverage anchored on FSO by Day and Nero from Washington Park with reports from Findlay Market area and the Reds Community Fund party. All four Cincinnati TV stations will shift into parade mode during noon newscasts. WVXU's Ann Thompson and Bill Rinehart will co-host CitiCable's live parade coverage in Cincinnati on Spectrum/Charter Channel 23; on Cincinnati Bell's Fioptics Channel 800 in Ohio; on the ICRC public access channel; and live streamed by CitiCable, Waycross and ICRC. WVXU also will be covering the parade throughout social media channels. Here's a link to our WVXU story about the parade route and street closings. 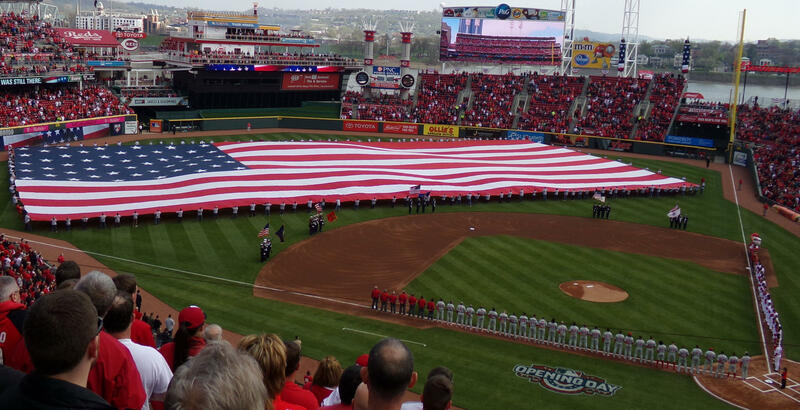 Great American Ball Park prepares for the "Star-Spangled Banner" in 2016. 2:30 p.m.: FSO' s Reds Live pre-game show hosted by Giesenschlag, Piecoro and LeCure starts simulcast on WKRC-TV (Channel 12). 4 p.m.: Reds vs. Pirates game. Brennaman and Welsh call the game on FSO. Marty Brennaman will call his 46th and last Opening Day game on the Reds Radio Network on 700 WLW-AM. Jeff Brantley will be the analyst; Tommy Thrall will do the post-game show. The radio pregame starts at 3:40 p.m. Immediately following the final out, Day will host FSO's Reds Live postgame show. Streaming on FOX Sports GO: If you can't watch FSO's coverage on TV, you can see the network’s coverage on your phone or tablet with FOX Sports GO. FOX Sports GO is available to customers of participating pay-TV providers on iOS, Android, Fire tablets and Fire phones, Amazon Fire TV and Fire TV Stick, select Windows devices, and online at FOXSportsGO.com. Fans can download the mobile app for free from the iTunes App Store, Google Play, Amazon App Store and Windows Store. A few things to know about Tommy Thrall, new Reds radio announcer: He loves baseball and he loves radio. He grew up listening to Hall of Famer Denny Matthews call Kansas City Royals games. And Reds fans have heard him a couple times – during spring training a year ago, and last September when Marty Brennaman was off hosting his annual golf classic.